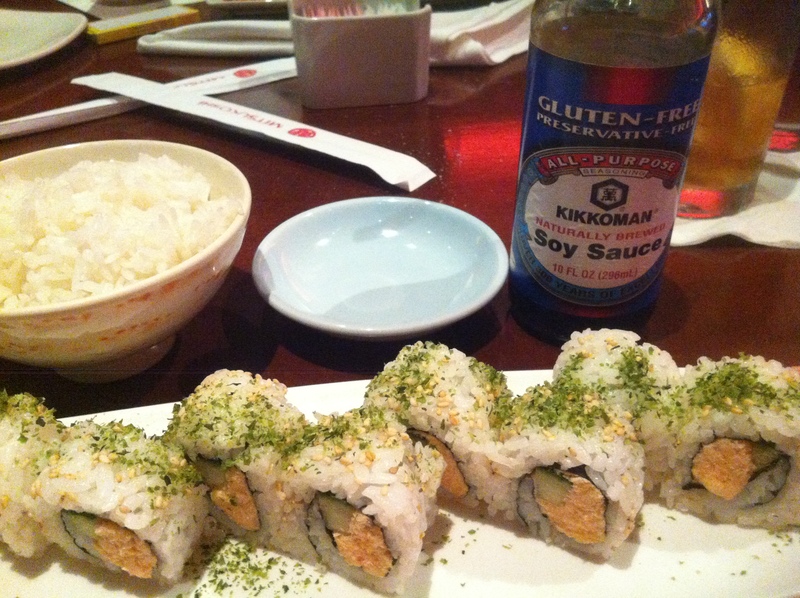 Amazing, totally gluten-free sushi from Tokyo Dining in Epcot’s Japan, complete with GF soy sauce. I started out on our recent family trip to Disney World with a little bit of trepidation. I’ve been able to almost completely eliminate the less-than-lovely symptoms that come with my gluten intolerance by cooking most everything myself, so travel can be sketchy at best. I’ll go over the getting-there parts another time (basically, bring food with you and know what restaurants are safe[r than others]). But oh my holy goodness, let me tell you this: If you have an allergy, sensitivity or other food-related issue, Disney has you covered. I’ve never experienced anything like it. It’s a gold standard that has changed my view of foodservice completely. For the unwashed, there are two types of foodservice on Disney property, counter service and table service. As outlined here on Disney’s own site, many counter service operations offer gluten-free options, and nearly every table service restaurant can take care of you in above-and-beyond fashion. In either style establishment, mention “gluten-free” or “allergy” and they immediately summon a manager or chef, who reviews your options with you. And unlike the typical real-world restaurant, they seem genuinely happy to do so, taking plenty of time to ask and answer questions. After one such conversation with the manager at Tokyo Dining in Epcot’s Japan, I told him I was amazed at the level of service offered to those with special dietary needs. He said it was simply part of the way they did things, and it freed him up to make people happy. He added that if he went on to another restaurant on the “outside,” he would carry that attitude with him. It’s not just about allergies and such, either. Any question, comment, side-eye, request for directions to the nearest ice cream/restroom/roller coaster is met with enthusiasm and grace by every single Disney employee, or “cast member,” as they are called. In Epcot, this is particularly amazing because Disney trainers must deal with all the customs of their cast from all over this planet. Y’all, EVERY FOR-REAL FRENCH PERSON in “France” was endearing and affable. That’s Disney magic right there. Is the customer always right? Of course not. But, in a hospitality situation, we can always make them feel awesome for being with us. In a nutshell, that’s what I learned. I’ll outline my own experiences in a couple more posts, so stay tuned.